In Lacoste v Long Chang Trading CC, the High Court of South Africa has injuncted Long Chang from infringing Lacoste's registered trade marks. In this case, the Plaintiff (Lacoste) instituted an action against the Defendant (Long Chang) for an order in the terms including an interdict/injunction against the Defendant for infringing the registered rights of the Plaintiff in the Lacoste trade marks. The Court found for Lacoste and a helpful summary (provided by very kindly by Msawenkosi Gaxo - Bowman Gilfillan) and a short comment from me at the end is provided below. For more from Afro-IP on Croc Fights click here. The Court had to determine whether marks used by the Defendant on its belts constituted an infringement of the marks belonging to the Plaintiff. The Plaintiff is a registered proprietor of marks including two crocodile devices in class 25. 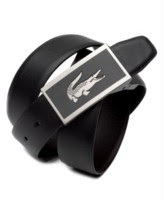 It is also a registered proprietor of the LACOSTE trade mark in class 25. The Defendant is the importer of a consignment of twelve thousand belts which were first detained and later seized by the South African Revenue Service ("SARS") in terms of the Customs and Excise Act, 90/1964 read together with the CGA as being suspected counterfeit goods. The basis of the detention and seizure was that the belts bore a mark similar to that of the Plaintiff's registered crocodile device. The Defendant conteded that its mark does not resemble the Lacoste trade marks and therefore deception or confusion was not likely. The Plaintiff's claim is pusuant to section 34(1)(a) of the TMA which reads: the rights acquired by registration of a trade mark shall be infringed by the unauthorised use in the course of trade in relation to goods or services in respect of which the trade mark is registered of an identical mark or of a mark so nearly resembling it as to be likely to deceive or cause confusion. The Defendant's belts are clothing classified into class 25. The Plaintiff has registered its mark in that class. The Defendant's use of its mark is in relation to goods in respect of which the trade mark is registered. The enquiry as to whether the Plaintiff's exclusive rights have been infringed is confined to the comparison between the two marks. The question is whether the representation of the two marks visually resembles each other to such an extent that it is likely that the average consumer might be deceived or confused. The Plaintiff's mark is a crocodile device. The Defendant's mark is a lizard device. Both creatures face towards the right if viewed from the front. Both marks depict two visible feet of the creature. Both marks have stripes running lengthwise along the creature, which extend to the tail. Both creatures have a tail on the left hand side, if viewed from the front, and both tails are raised and turned above the body of the creature to point in the same direction that the head is facing, towards right. The difference between the two marks is that the Lacoste crocodile device has an open mouth while the Defendant's device does not. The Defendant's mark has the word Anole in the centre of the device while the Plaintiff's mark does not. The question is whether the depictions of the respective marks are such that they are so different and are clearly visible to the average consumer. The Court referred to Plascon-Evans Paints Ltd v Van Riebeeck Paints (Pty) Ltd 1984 (3) SA 623 (A), where it was held that in an infringement action the onus is on the Plaintiff to show the probability or likelihood of deception or confusion. It is not incumbent upon the Plaintiff to show that every ... customer ... would probably be deceived or confused. It is enough for the plaitiff to show that a substantial number of persons will probably be confused as to the origin of the goods or the existence or non-existence of such a connection. The Court also referred to Distilleerderij Voorheen Simon Rijnbende en Zonen v Rolfes Nebel & Co 1913 WLD 3, where it was said that to constitute an infringement of a trade mark there must either be an adoption of a trade mark or of its essential particulars, or one of them, or else a colourable imitation of the mark or some one or more of its essential particluars. The Court found that the Defendant's mark has more than one of the essential particulars of the Plaintiff's mark, and the marks to be very similar if not identical. It found the impression of the two marks, even to an average consumer acquainted with the Plaintiff's mark, is likely to cause confusion, as there are no dominant or striking features that immediately serve to distinguish one from the other. The Defendant was interdicted from infringing the registered rights of the Plaintiff in the LACOSTE crocodile device trade marks. The Defendant was ordered to pay the costs of this matter, including the costs of two Counsel. The court only dealt with the issue of infringement and unfortunately, apart from the description of the marks, Afro-IP does not have a visual format to consider. It is interesting though that the RSA courts (and apparently Counsel) chose to use 1913 and 1984 judgements as a basis for the test applied to contemporary infringement. With wording in the SA Trade Marks Act (1993) that is very similar/nearly identical to the European Harmonization Directive and the vast number of European judgements (and other South African judgements) on that wording, it is curious the Court (and apparently Counsel) did not seek to take advantage of that jurisprudence. I came to a similar conclusion when reading the draft Namibian legislation which differs from the South African legislation in places where, at first glance, it seemed more effecient to use tried and tested contemporary language from either the South African or European context.